This installment will review applications that serve as learning and hobby tools. It will range from beneath the surface of the Earth to orbiting the Earth. If you are into archaeology and/or finding things with metal detectors, then Happydigger may be an application for you. 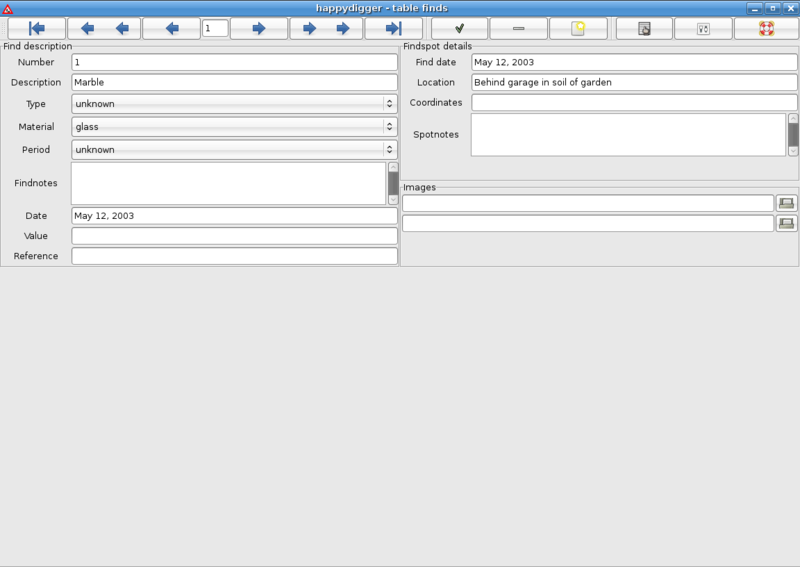 Using sqlite for its database, Happydigger allows the amateur archaeologist to catalog finds. Images can also be included with the information of an item. Who knows, a little digging in the dust of past generations may unearth a rare find like a 1793 penny? Have a substantial book collection? 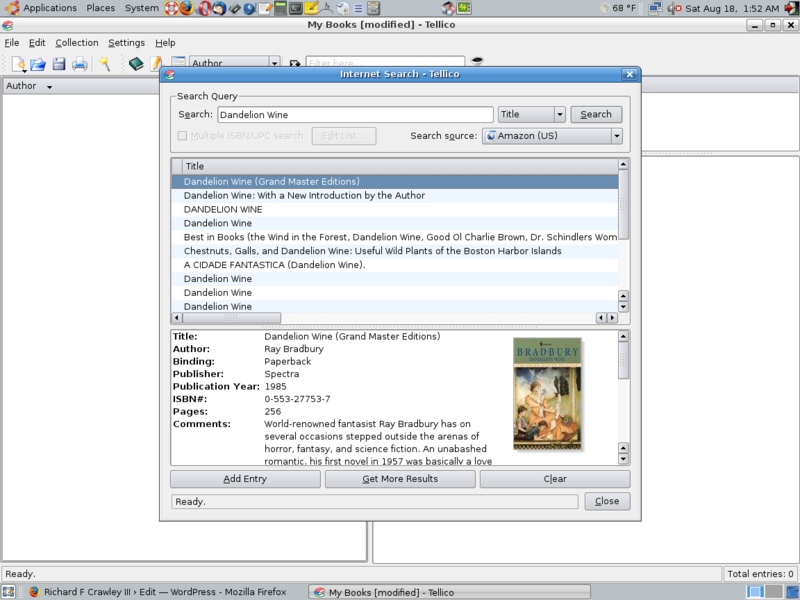 Alexandria is a GNOME application that catalogs your books and retrieves information on them from a variety of online sources. Once a book is in the database, your rating can be added along with notes and you can mark if you have loaned it to someone and who you loaned it to. It is like running a private library, all it lacks is a way to charge fines for overdue books. If you collect a bit more than just books, then the KDE application Tellico is a better fit. It catalogs your books and everything else you might collect — stamps, CDs, albums, games, wine, comic books, cards, coins, videos, or any custom collectible you with to categorize. Like Alexandria’s slick “Add a book” box that returns textual and visual data on your book, you can search for a book online, but textual information is all that is returned until you click on the text to gain a visual on the book’s cover. It gives you a larger photo of the cover than Alexandria. Tellico will import Alexandria data in just a few clicks, although it does appear cover images and author names are not included. I am not sure if it is the differences in the databases or just what causes this. Oddly, book ratings do import correctly. When entering an album or artist via internet search, it does not return any values although it does a search. Come on, “The Beatles” returns nothing when searching for albums? Likewise, not every collectible category has a searchable online database to pull information from… such as comic books. Jeff Albertson would be disappointed. Alternately, you can manual enter data on a book, album, comic book, etc. by popping up the “New Entry” box. It adds to the overhead in creating a collections database, but it adds to the amount of data that can be recorded. Both Alexandria and Tellico are nice applications to document collections. Should you ever lose your collection to fire, hurricane, tornado, flood, or theft, having a catalog of your collections will greatly assist you in filing an insurance claim. It is also a nice way to organize your collections. I like Alexandria’s online search better than Tellico’s, but Tellico’s versatility for documenting other collectibles is another thing that I value. Try them both. See what best suits your needs. While the government keeps tabs on you, why not keep tabs on them? 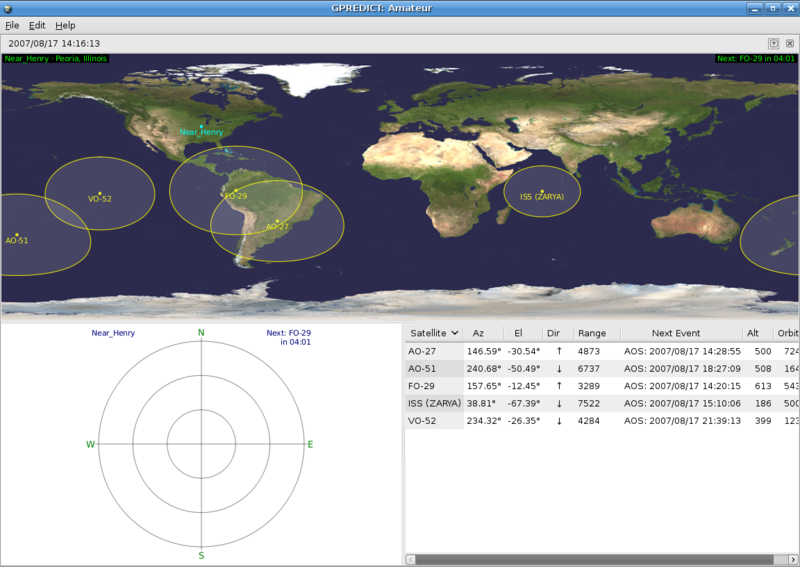 GPredict will help you locate and track the satellites that orbit the Earth. You can follow the sweeping orbits of the International Space Station, the Hubble Space Telescope, Iridium satellites, weather satellites, and many more. By knowing the track of their orbits and when they will pass overhead, you can follow them across the night sky. And if the government wants to know what you are about and the optics are as good as they are rumored to be, then why not be polite and slip outside to wave, moon, or salute (with whatever combination of fingers you wish to use) it for its extremist efforts? Of course you can also use GPredict for developing less paranoid interests in rocketry, orbital mechanics and mathematics with your children. There are many, many applications that assist learning or complement hobbies. Searching for them within software repositories and/or online application/project listings are great ways to find them. The next installment of Lesser Known Applications for Linux will cover Celtx. Until then enjoy your hobbies. Nice…keep on the good work, I will try alexandria. freshmeat.net is the place for finding applications, IMO. Robby Stephenson notes that Tellico’s use of the Yahoo Audio Search API appears to be working again, so a search results for “Beatles” now returns results. Robby has a lot of good information on periapsis.org. Periapsis has a lot of articles on space and JPL. I could spend a weekend perusing the site. I’ll have to sit with my nearly 3-year-old son and look at the space articles. He has told me on numerous occasions that he is going to walk on the moon. I hope he does. I always wanted to be a scientist or an astronaut. If I’d been wiser twenty years ago, I’d have asked one of my favorite professors, Dr. J. C. Hafele, for some help in guiding me down that path. I hope my children grow to be wiser than their father by making use of the opportunities available to them. Try stuffkeeper in place of tellico and alexandria. It is very versatile and user friendly.A package for Ubuntu is available.